Some Las Vegas apartment communities might get an upgrade this year, thanks to an aggressive investor that’s creating a ripple in the local market. TruAmerica Multifamily, a California-based investment firm, is looking for its next move in Las Vegas’ multifamily sector. “Our hope is to expand our holdings in Vegas this year,” said Noah Hochman, senior managing director, acquisitions and investor relations. The company entered the Las Vegas market with a splash, buying Solis at Flamingo — a 524-unit complex near the corner of Pecos and Flamingo roads on Las Vegas’ east side. TruAmerica acquired the property in an off-market purchase from Alliance Residential for $50.5 million. TruAmerica has operated since June 2013 and targets properties in the western United States. Hochman said TruAmerica has done a lot of work in the Pacific Northwest and Southern California. That all changed in 2015 with TruAmerica’s expansion to Salt Lake City, Las Vegas and Portland, Ore. Since its inception, the company has acquired around 8,000 units, said Hochman. And the portfolio now stands around $1.8 billion. TruAmerica is a partnership between The Guardian Life Insurance Co. and Robert E. Hart, an investor. Guardian has been in operation for 150 years. Along with life insurance, Guardian also sells individual dental insurance plans and disability income insurance. Its services also involve money management and investment opportunities in annuities, individual retirement accounts, mutual funds, money market funds and brokerage accounts. Guardian is a Fortune 250 financial services company with 6,000 employees and a network of more than 3,000 financial representatives. Hart, TruAmerica’s president and CEO, has been in the multifamily industry for 28 years. He has been involved in more than $6 billion in acquisitions in the United States and Japan. Hochman directs the company’s acquisitions and investor relations. He also oversees the Washington, Colorado, Oregon, Hawaii and Nevada markets. 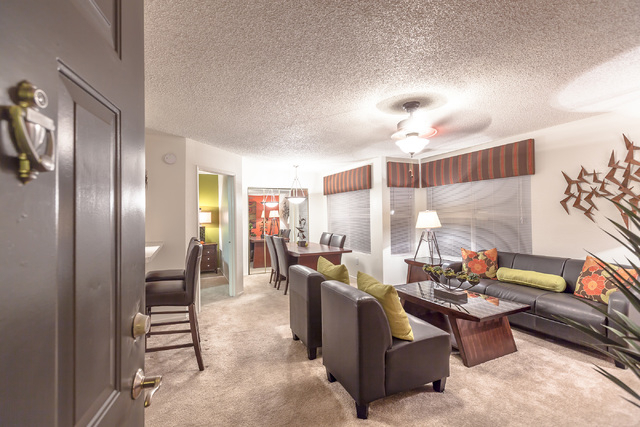 The company purchases, renovates and repositions multifamily properties. Solis matched the criteria TruAmerica seeks in a purchase. “I think the profile there was very similar to what we look for which is a late ’80’s early ’90s product that needed some capital to make it more competitive in the marketplace,” said Hochman. Beyond property age, Hochman said the company’s target properties also serve a certain demographic. Hochman said TruAmerica is sensitive to incomes when they take over a property. Updates for Solis will cost more than $5 million and will include interiors and maintenance. There are also plans to enhance the clubhouse and other amenities at the property, Hochman said. Hochman said TruAmerica moved Las Vegas up on its target list because the city is starting to recover. “Las Vegas was always a target, but we decided to prioritize in 2015 as we begin to see the recovery take hold,” Hochman said. The numbers show TruAmerica’s timing for Las Vegas is opportune. Reis, a data company serving commercial real estate professionals, showed a positive trend in vacancy rates in its first-quarter report. Vacancy went from 5.4 percent in the fourth quarter of 2014 to an even 5 percent in the first quarter of 2015. In first quarter 2010, the vacancy rate was at 11.8 percent, Reis reported. That number fell at a rate of 1 percent to 2 percent per year until 2013, when the decrease slowed slightly, the report shows. But vacancy rates still fell almost a percent from 5.9 percent in the first quarter of 2014 to 5 percent in this year’s first quarter.